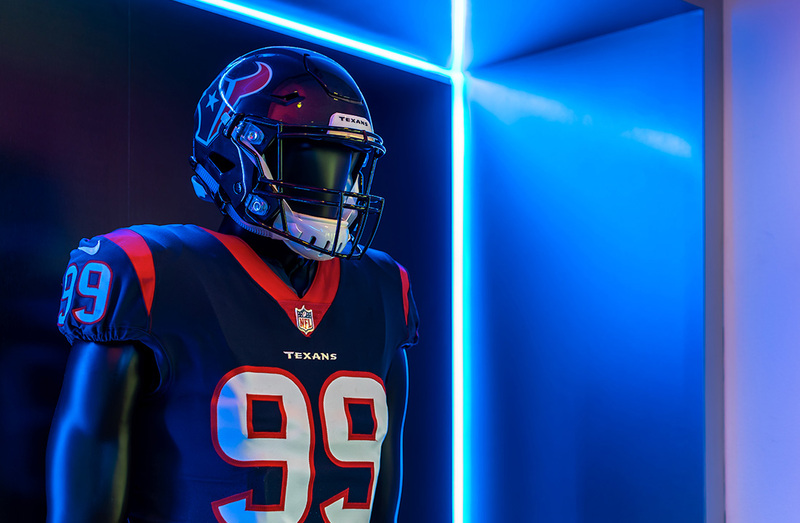 The Houston Texans recently refreshed their team headquarters in Houston, and they invited 2020 Exhibits to energize and revitalize the space. 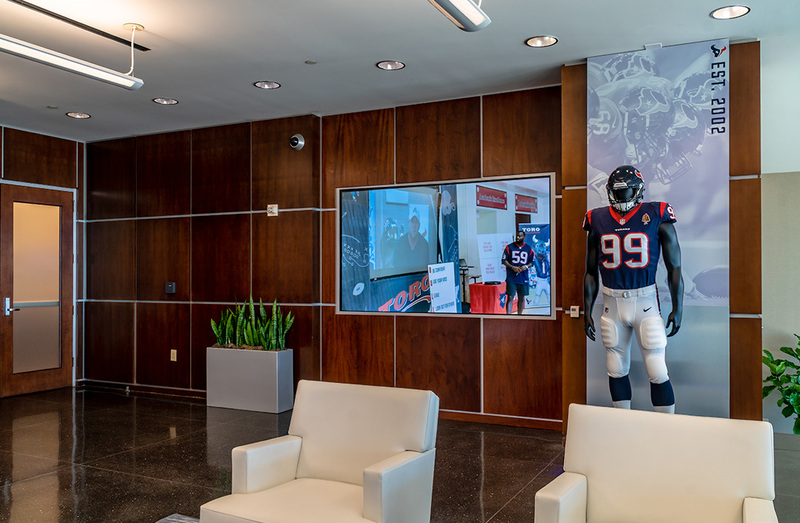 Uplifting, vibrant, inviting, sophisticated, contemporary yet traditional—are all apt descriptions and intended goal of the newly refreshed space for the Houston Texans corporate HQ in Houston, Texas. 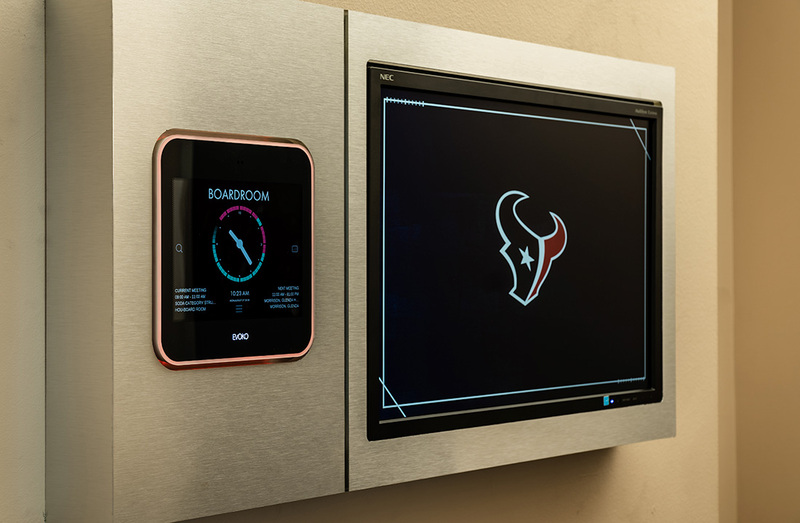 From the initial meetings and conversations with the Texans, along with the walk-through, the 2020 Exhibits team gained a true sense of the environment and the overall vision for this environment. 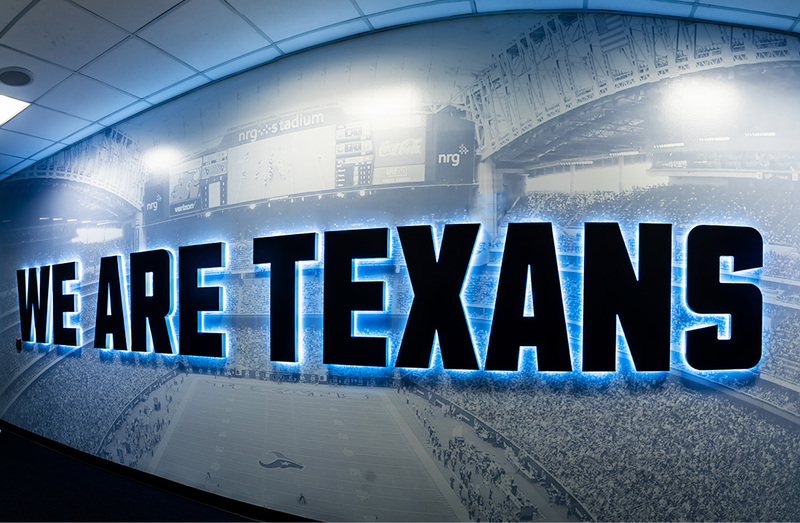 Drawing inspiration from these powerful images and a strong sense of the Texans’ drive, vision, and championship mentality, 2020 Exhibits worked collaboratively to deliver an engaging, inviting, uplifting and one-of-a-kind experience and environment that is proudly the Houston Texans. Informed by a deep understanding of the Texans’ spirit, drive and mission combined with creativity and insight, 2020 Exhibits’ design is infused with the vibrant high-energy expertise and experience that is the Texans. Championing the Texans’ mission to win championships, create memorable experiences and do great things for Houston, this remarkable headquarters is a sophisticated, timeless space that seamlessly blends purpose and place to showcase the powerful story of the space as a destination experience that visitors, employees, and team members alike will want to admire, celebrate, and share, with an elevated sense of pride and place. 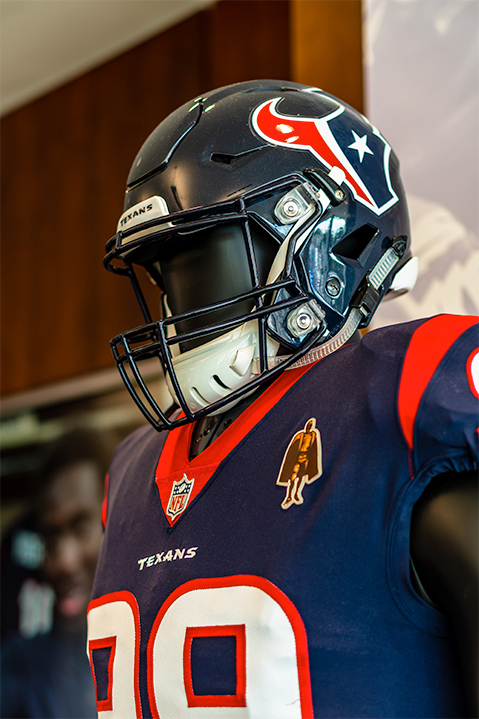 As a warm Texan-sized welcome and invitation to experience the Texans, 2020 Exhibits helped the Texans further connect current and future players, guests, fans, and the Corporate Team to the rich history, dynamic present, and exciting future of one of the National Football League’s most remarkable programs. 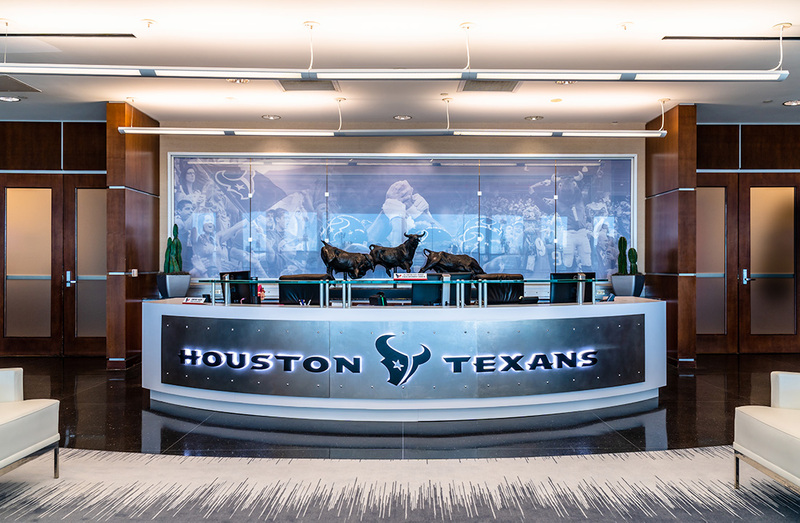 The experience begins at once, at the swooping, curved desk immediately seen by visitors as they enter the reception area are greeted with backlit Texans logo, framed by a custom designed and printed emotional graphic wallpaper image of the Texans’ in game day action. 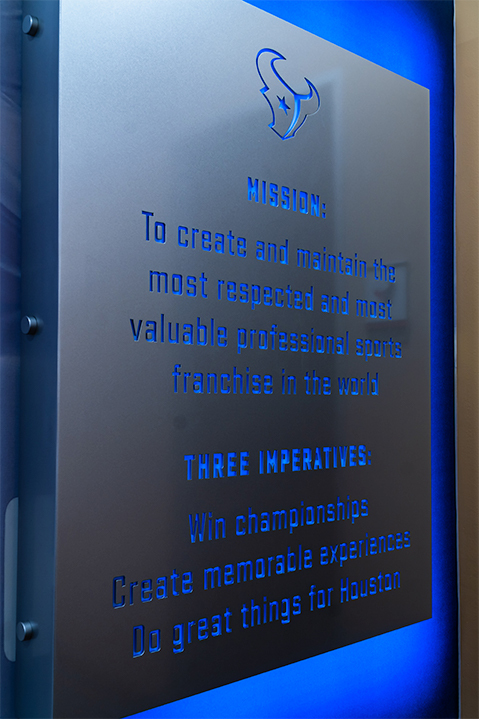 These images, coupled with modern and inviting contemporary furnishings, a large video monitor showcasing game-day action immediately tell the story of a mission-driven, championship-level organization. 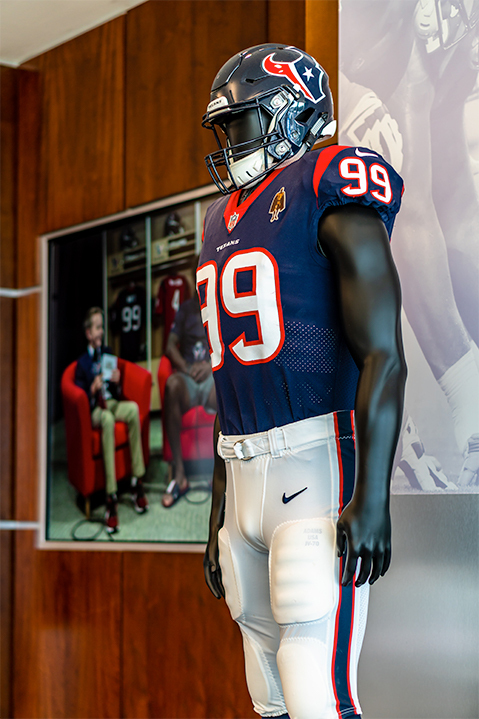 Custom wall graphics provide the ideal backdrop for the sturdy, life-like football player mannequin which flanks the massive video wall. Let there be light. 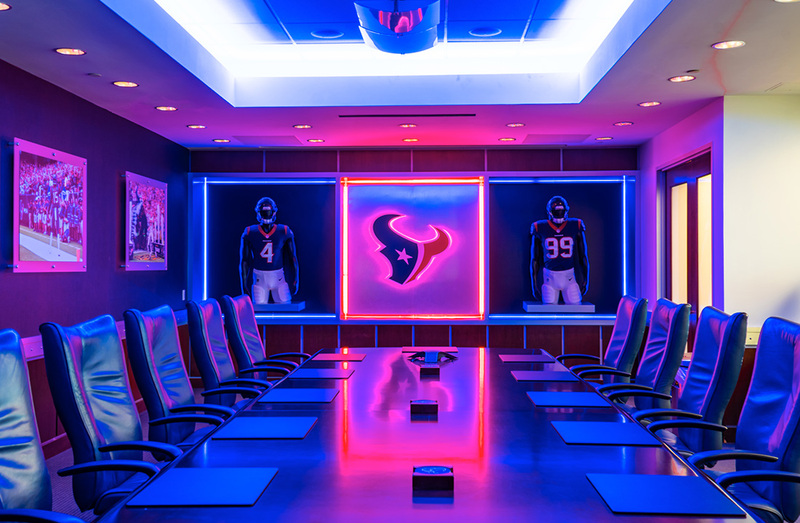 With endless flexibility, the Texans can now change the LED lighting in the Board Room to mirror the theme for each game. The lights are programmable and can be edited as per event or needs, ranging from Liberty White, to pink for Breast Cancer Awareness, Battle Red or Deep Steel Blue, brilliant light and colors punctuate the space, infusing it with energy and excitement. 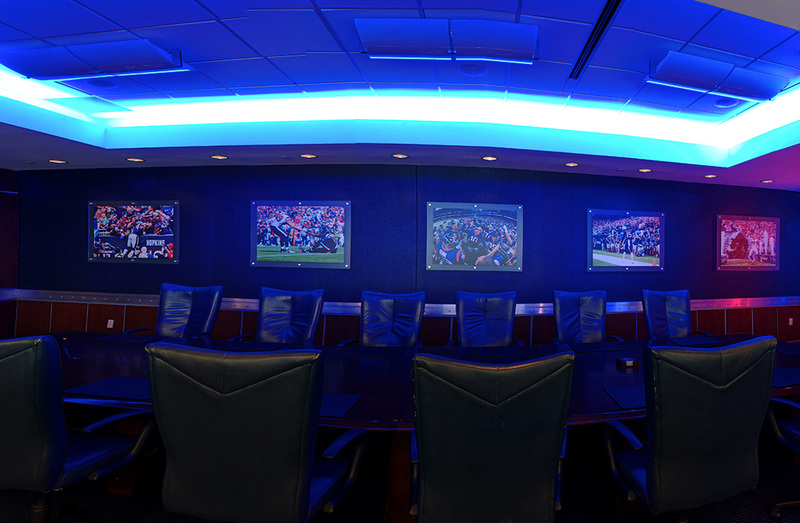 Blending high-energy game imagery and cove-edge lighting on the ceiling with custom, flexible lighting throughout the space adds motion or dimension, and sophistication to this one-of-kind conference room. 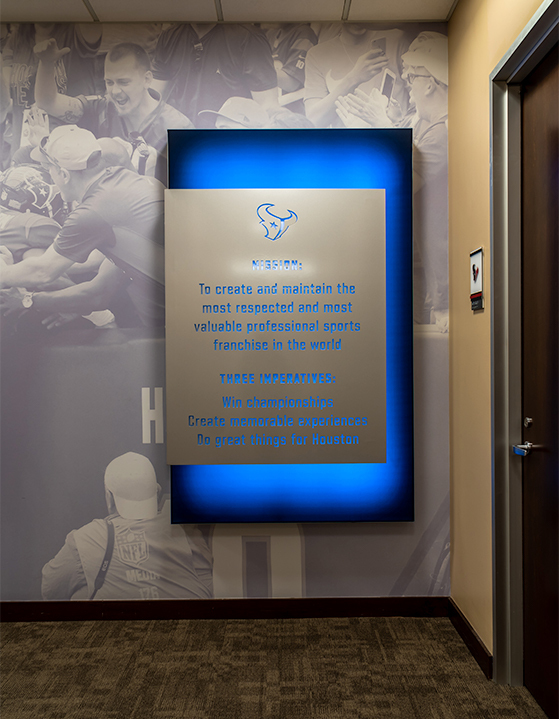 While function matters, this entirely new Mission Statement Wall celebrates the heart of the Texans. Cheering fans adorn the custom black and white wall graphics, to offset and call attention the MISSION, which is highlighted by a custom fabric light box creating the ideal background for this custom brushed metal sign. 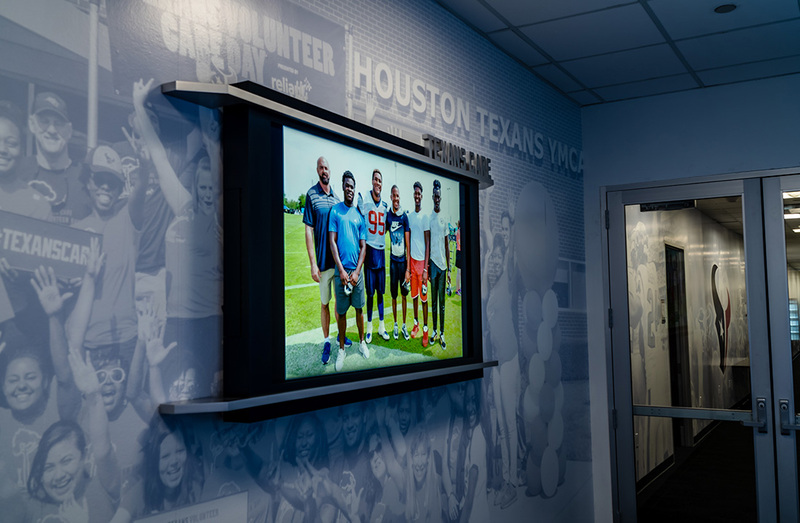 Great past players and memorable moments in Texans history are honored, with stark white surfaces and a healthy dose of Texans branding give a high-end finish to the energizing Media Wall. 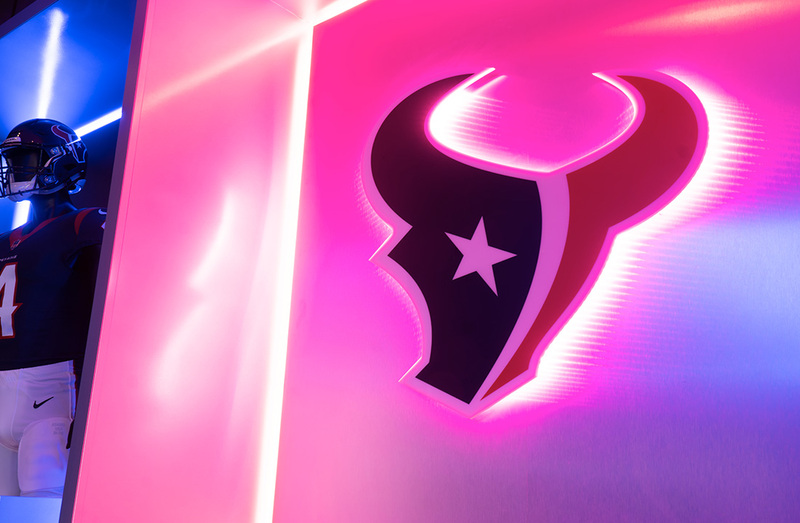 With a style and finish worthy of great champions, this newly refreshed space brings guests, visitors, fans, and employees together, as fans of the Texans, who can celebrate the team and Texans brand experience in a way that is as innovative as it is substantial. Touchdown.